Greetings Air Potato Patrol Members! We are thrilled with the response we have gotten from the public so far. If any of you have a friend, neighbor or relative who you think would be interested in joining and getting involved please forward the website to them. In this first blog post I want to answer some questions that came up in the comments section of the contact forms everyone filled out. You would want to check to make sure you don’t already have them. Remember that very few other insects eat the invasive air potato vine, so if any of the leaves have holes chewed in them you would want to review the video on beetle identification and look very closely for them. Residents frequently find that they already have the beetles on their vines and don’t need to order more. Remember, these beetles are good flyers and can move on to your property from neighboring patches of vines. Reviewing these videos will help with air potato and beetle identification, along with the biology and habits of the beetles. We will be sending out our first survey questions and directions very soon. Please watch your e-mail inbox for more information. Thanks for your questions and notes that you included in your contact form. Air potato beetles are not nocturnal, so you don’t have to survey for them at night. Over time we will post more information on chemical and other controls for air potato vine, and information on how to follow Integrated Pest Management principles. As always feel free to contact us if you have any questions, comments or suggestions. Or, feel free to comment below. yeah!! We love the air potato beetle here in Indian River County. Way to go little guys! Looking forward to contributing to science! Last year my beetles arrived the week before Hurricane Matthew blew in. My guess is that they are happily munching the vines in Nicaragua or Mozambique… They definitely are no longer here! Feel free to order more if you’re reasonably sure that you don’t have any in your yard. Just fill out the form and follow the directions. This program should get involved with local middle and high schools as this represents an excellent view of not only plant biology but the study of insects also – all impacting local communities. What better way to show the impact of science and have groups providing teacher-led, accurate data to the scientists. Should also send the link to every public library in Florida to get more residents involved. Thanks for the kind comments. We will be publicizing and hopefully growing this program this summer. We’ll have to look into creating a school program too. Safety – is that Safety Harbor? There are efforts under way teaching elem. school aged kids. I have been invited by our S.H. Elem. School three years in a row to teach 3rd and 4th grade students about the a.p.v. and the beetles. I do show and tell – the kids are very receptive! I was also invited to teach a group of summer school kids (on location at two different parks), twice this month. We talk for 15 min, I quiz the kids, and then we spread out to pull down vines and dig out potatoes and collect them carefully for me to dispose of. I do think that teaching the kids is our best chance, along with the beetles, to continue to make a difference. Thank you to everyone in the beetle project. From rearing and harvesting to distribution and research, thank you so very much! Our “Samari Warrior Beetles” are a welcome addition to our existing efforts – namely, and old man with gloves, clippers and shovels. That would be me. Our SWB’s reduced acres of vine to lace the year before last, but they didn’t survive well over th e winter that followed. We’re hoping that the recent infusion of new beetles will bolster their fighting forces to what we had in year one. Thank you again to all involved. Thank you RC. The beetles did not overwinter well across much of Florida the year before last, which is how Dr. Kerr and I came up with the idea for this program. He wasn’t sure why they did not do well and the research you are helping with will hopefully give us a better understanding (and advance warning) of how the beetles do overwinter. What do the beetles eat during the winter when the vines die off? The beetles enter a type of insect hibernation called diapause. They overwinter as adults, many of them don’t survive, but ideally some do to re-emerge the following spring, mate, lay eggs and repeat the cycle. One thing we are looking at is how well do they survive diapause in different parts of the state. This is where your help and data is important. Here too, “old man” w. tools, R.C. White … after 3 years of manual work out there, we appreciate the beetles; and here too – not many, if any, seemed to have survived. We noticed an emergence last night of the pupue in the same location where we had noticed them last year, in vines over an old mulch pile. I imagine they like wintering in a nice, warm trashy yard waste. May I pick a leaf of them and move them to another location where the vines are healthy? Or should I leave them to migrate on the property on their own, especially since we are “part of the study”. If the other vines are on your property or close by, the adult beetles will move there on their own. They are very good fliers and move to new sites all on their own. Air Potato Beetles were sent to me 2yrs ago. I see some evidence that they are on my property, but there are far more uneaten air potato vines than eaten. Should I order more, or wait for some time to elapse? If the beetles are already there you may not need to order more. They reproduce rapidly this time of year. We will be making a short video on how to check your vines to see if you have beetles present very soon which you may find helpful. Also remember for our shipments we are generally sending only 40-50 beetles. These serve as a seed population, if you are already seeing beetles adding a few more beetles will not make a drastic difference. It takes right around one month for a generation to develop. After that first month you notice them the amount of damage you notice should increase dramatically. However, if you would like to request more beetles feel free to do so. Participation in this program will not bar you from requesting more beetles, we just ask that you indicate any releases conducted on the surveys as they go out. We were hoping the beetles we released the year before last would have eradicated the vine on our property. While they did most definitely knock it down considerably and we do see a few vine leaves with holes in them we are sad there seems to be more vine than beetles to destroy it. This vine sure is tenacious stuff! I searched for beetles the other day and while I did see a few leaves with holes (5 to be exact) I was not able to find the elusive beetles. I must practice my hide and seek methods! The beetles will never eat 100% of the vines, but they do knock it back and slow it’s spread. We will be posting a video very soon on how to figure out if you have the beetles and how to find them. Just finished my survey and didn’t find but 3 beetles and they looked like they may be in going into another stage- if they were the beetles, they were bloated in size. About 2 weeks ago, many of the leaves were loaded with the air potato beetles but these same vines were empty today and some but not all leaves skeletonized. I will patiently wait for the next “generation” as there are plenty of leaves to munch on. I was so happy to see the return of the beetles from the last time I ordered them in 2015. My survey site used to be my side yard with 4 live oaks and lots of vegetation and, of course, APVs. Now my new house is there and only one live oak (others had to sadly be removed to fit in the house). I did leave a natural area in the back 20 feet of the yard and that is where the APVs returned, plus around the remaining oak and other saved trees/landscaping. Had my grandkids helping me pick up potatoes during the winter months! I got a bunch of beetles about four weeks ago. I distributed them on about 15 different vines. I went out on 6/12 and after 15 minutes of looking, I could not see even one beetle. I did see some leaves with holes in them but not the amount I would suspect considering the amount of beetles released. One fact is it has rained almost every day for the last 10 days. Would that have an effect on the beetles being on the leaves? I saw the first larvae of the year (in my area), in Clewiston last week. I have not seen any larvae yet near Labelle. Last year we saw the first larvae in June and July. It looks like that will happen again this year. The overall area covered by Air Potato vines have not decreased (or increased) after 2 years of heavy feeding by APBs. However, there have been very few potatoes produced for the last 2 years. Hopefully the vine coverage will begin to decrease. Following the sentiments expressed above, we want to thank you so very much for this program — it’s wonderful! The beetles have made a noticeable impact on our acre-and-a-half property and they are busy at work (and hopefully reproducing!). I’ve shared the information with our Englewood Family Garden Club and the members find the program of great interest and have shared the information with other Englewood residents. Thanks again! That’s great! The more people participating and learning all the ways to reduce the volume if air potato in the state the better it is for all of us. Most of our vines are on the other side of our side fence and the dense underbrush is difficult terrain to collect the bulbils. The vines seemed to die off 3 months after the release of the beetles, then winter came. We never had a frost or freeze but the vines seemed dead. Well, they are now back and growing with a vengeance! The beetles are back also. My question is that if we don’t collect all the bulbils then I suppose we won’t be able to irradicate this plant? It’s a vicious cycle. The bulbils that the vines produced in the past can and will sprout if they fall on the ground. But over time the beetles will reduce bulbil production, so in the long term the vines will spread much less. If you have the beetles working on them all summer you should see fewer bulbils being produced this coming fall. In the spring of 2015 I released 50 beetles on a 5 acre site in Osceola County that was covered with potato vine By the fall of 2015 the potato vine was nearly all gone and the Beatles disappeared. There was very little potato vine in 2016. This spring the potato vine in back, covering about one acre. The beetles do disappear in your part of the state in the fall. They normally return in the spring, but we have had years when very few returned. You would need to check closely to see if you have any beetle activity on the vines this year. If not you can order some from FDACS- the link to the form is on this blog post. I am finding holes and chewing on the leaves, but no beetles, and no skeletonizing. I am grateful for this blog, and patrol, and based on the beetles not returning early in the season last year. Keeping a hopeful watch. Within two weeks, visible beetle damage in an area of 12′ X 12″ from the release area. About 37 larva are visible and there are six areas of larval damage. They do a good job to the leaf at this stage. That’s great! That’s just what we want to hear. We are excited to be part of the Air Potato Patrol! We received and released beetles on our property two years ago. The first summer, we were amazed by the results. Last year we really didn’t see evidence of the beetles and the vine grew out of control again. We wondered where the beetles had gone. But this year they are back with a vengeance. We have seen adults and larvae, and the vine is dying all around us before it has a chance to get a stronghold. So awesome! Also, I have taken tons of photos if you would like any. Hi Elizabeth- That’s great! Feel free to e-mail me pics (they help with creating presentations) and now you can post 1 picture with a response (just look at the bottom of the page where you would post a comment). Outside the house we have a large live oak. A number of years ago it was full of air potato vines. I cut the vines on the trunk. The ground around the tree is alive with newly sprouted plants, undoubtedly growing from the dropped bulbils. My concern is that about 15 feet up the trunk of the tree is a bowl where bulbils obviously feel and took root. So I now have plants sprouting high up the tree and taking off skyward. I feel I can wait for my beetles to arrive to address this area as well as two other areas of infestation. However, I’m considering using Roundup and a ladder to try to spray a stream of herbicide up to the area of the tree where the “bowl” has been created. Would this be advisable? I would hate to damage this 50-year-old oak specimen. It’s really very much a part of the house, if you know what I mean? You may need someone to specifically look at the situation, but my general recommendation would be to simply remove the rooted/tuber portions of the vine from the tree. If you get herbicide on the oak you will have the potential of damaging the tree; the extent of that damage would really be dependent upon the dosage and placement of the herbicide. Thanks, Chris. I appreciate your reply. However, there’s nothing “simply” about trying to dig a bulbil out of a crotch of branches some 20 feet up in the air. If I let this particular plant go, it will continue to drop bulbils into the soil below. Unless I can convince some beetles to home in on this singular infestation, it will continue to reseed the area — forever. I have released beetles the last two years with good result on the vines. I have not seen evidence of return last year or this, so I have more on order. Thank you very much for this program! Together we will defeat the noxious vine! 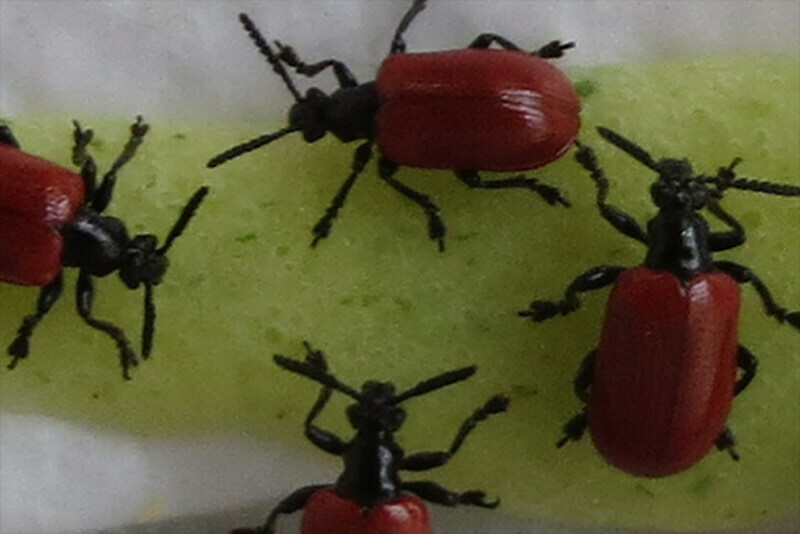 We released 45 beetles last August and they did a good job of eating the APV. The vine appeared this Spring and it is back with a vengeance. We see many eaten leaves, a few beetles and larva but the vine is overwhelming. Should I hope that our beetles can eradicate APV or should I request more? If you see feeding damage, beetles and larvae the population should build up rapidly. Ordering more beetles and adding them to the system probably wouldn’t make that large of a difference in the long run. I have a question. Does roundup kill the bulbil as well as the vine? Remember, the bulbil is the aerial propagules that are being produced in the current year not the underground tuber that is supporting that vine. The developing bulbils are generally not killed by such applications to my knowledge. Previous testing of applications directly to bulbils before they sprout indicated only delayed sprouting at best. The active ingredient in Roundup can kill the underground tuber, but it doesn’t always happen that way. It’s critical to time your herbicide application to when the plant is actively translocating back down into the tuber. Even then do not expect 100% of the tubers to be killed, but reasonable expectations can be as high as 80%. Three days later and I’ve found 4 more spots of skeletonizing and now the pupae have turned into adults, so I did my duty and answered my survey with a report of 73 bugs in 15 minutes…all mostly found where the skeletonization is occurring. Very exciting…is it OK if I move some of the adults to areas where there is no visible activity? I forgot to mention: I, too, very much appreciate the beetle program and now additional education, surveys and a place to comment or pose questions. Do birds, camelions or other predators feed on the young or adult beetles? We noticed a lot of very active brown larvae under the potato vines leaves one day and the next day they were all gone! Beetles and other insects are an important food source for a variety of other organisms in the environment, including birds, lizards, amphibians, spiders and other insects. The larvae may have moved or dropped to the ground to pupate.